There’s a lot of junk that builds up on a Mac over time. The Trash fills up as do caches. There are also large language files, localizations, and other system files that most people don’t need. To eliminate the junk and keep as much space free as possible on my Mac, I’ve used CleanMyMac by MacPaw for several years. Today, MacPaw released an update to the app called CleanMyMac X in honor of the app’s ten-year anniversary. The vast majority of the time I use CleanMyMac to free up space on my Mac. However, CleanMyMac does more than scan your Mac for junk and remove it. The app has grown over the years into a suite of utilities that also includes an uninstaller, system maintenance checks, privacy tools, large and old file removal, and a file shredder. That list has grown with CleanMyMac X, which has also been significantly redesigned. 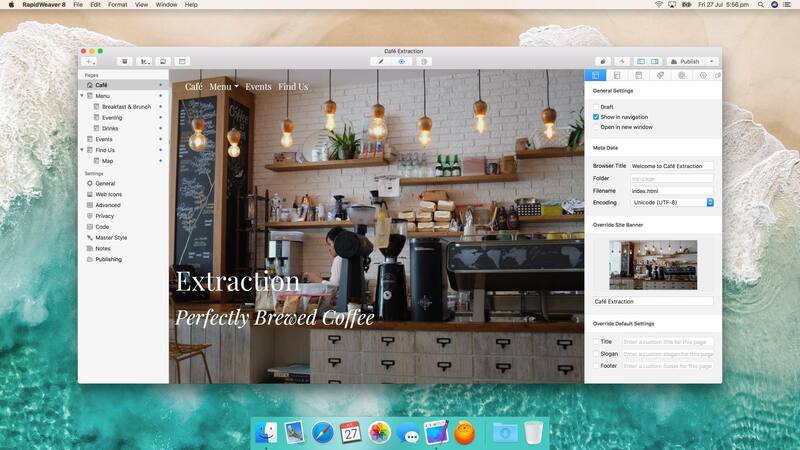 RapidWeaver by Realmac Software got a significant update today. Starting from scratch or with one of over 50 Themes, RapidWeaver allows users to create highly-customized websites by offering a wide array of tools and properties that can be tweaked. The app also supports third-party plug-ins and Themes that can be used to extend the app even further. RapidWeaver may remind you a little of iWeb, but the similarities end with the drag and drop, template-driven approach. The depth of RapidWeaver goes well beyond what iWeb could do before Apple discontinued it. I've been playing around with GoodTask, a Reminders client for iOS, as part of my experiments with Shortcuts and Reminders for this year's iOS review. GoodTask is a powerful utility that extends Reminders in ways that I'd love for Apple to consider whenever they decide to update their own Reminders app. GoodTask has grown a lot since its debut four years ago; I recommend reading Tim's review of version 3.0 to get an idea of its capabilities. 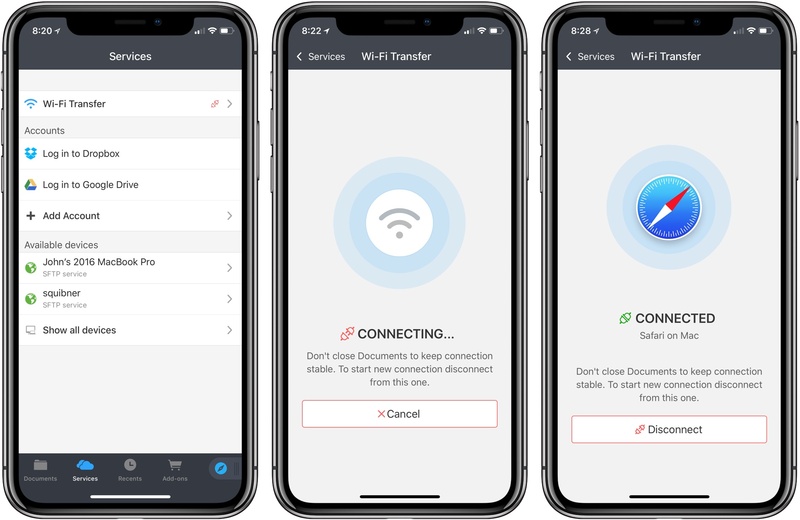 The app has got a bit of a learning curve, but it's much more powerful than Reminders while retaining its key advantages (such as Siri integration and immediate background sync between every Apple device). Today's update to GoodTask brings a couple of features that I suggested to its developer a while back. The first one is a quick action to reopen a web link (or URL scheme) contained in a reminder, if any. This makes it easier to use GoodTask as a repository for links saved from Safari (perhaps through the Shortcuts extension). I like the way GoodTask automatically extracts URLs from the Notes field of a reminder, and this quick action speeds up the process of reopening links a lot. The second feature is a change to the 'Scheduled' filter for smart lists, one of the best ideas in GoodTask. Smart Lists are liked saved searches for reminders: they let you create custom lists (which you can only view in GoodTask) to manage a subset of reminders based on specific filtering criteria. For example, you can create smart lists for reminders with a specific tag (another GoodTask-only option), items that are overdue, or reminders that are due within 3 days and have a high priority. 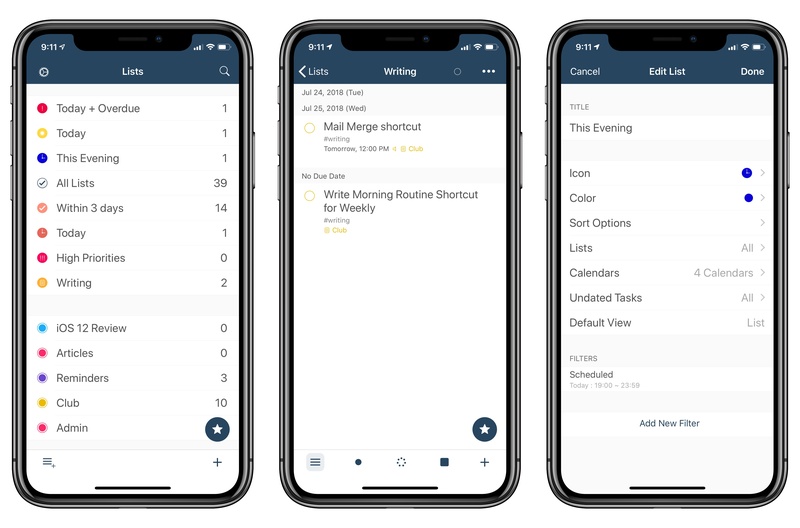 In the latest version of the app, you can create smart lists for reminders that are due between specific start and end times of the day. Essentially, I wanted to replicate Things' fantastic Today/This Evening feature in GoodTask. With smart lists in version 3.9.1 of the app, I can now use the 'Scheduled' filter to show me reminders due today (between 6 AM and 7 PM) and in the evening (between 7 PM and 11:59 PM). It's not quite as elegant as Things' native feature, but it lets me have a similar scheduling setup in GoodTask as well. I'll have more to share about GoodTask over the summer as I continue to experiment with Reminders and Shortcuts in iOS 12. In the meantime, if you're looking for a great alternative to the Reminders app on iOS, you should take GoodTask for a spin. Documents by Readdle has been on the App Store a long time. 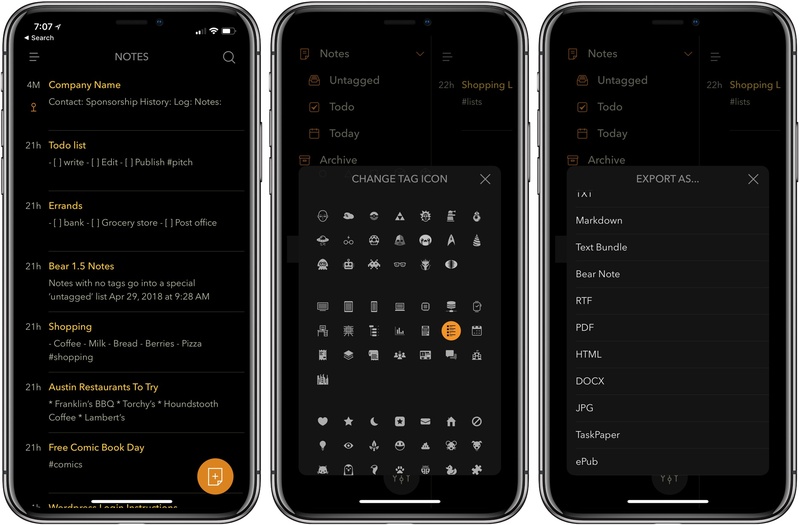 Before Apple released its Files app, Documents filled the gap with features that made it indispensable for accessing files on iOS devices and doing things like unzipping an archived folder. Although the stock Files app has taken over many of my day-to-day needs for file handling, Documents continues to evolve and adapt, providing tools that aren’t in Files. Today, for instance, Readdle added WiFi file transfers between a Mac and iOS device to Documents. The system is easy to use and more flexible than AirDrop, making it something to keep in mind, especially when you are moving large numbers of files between a Mac and iOS device. 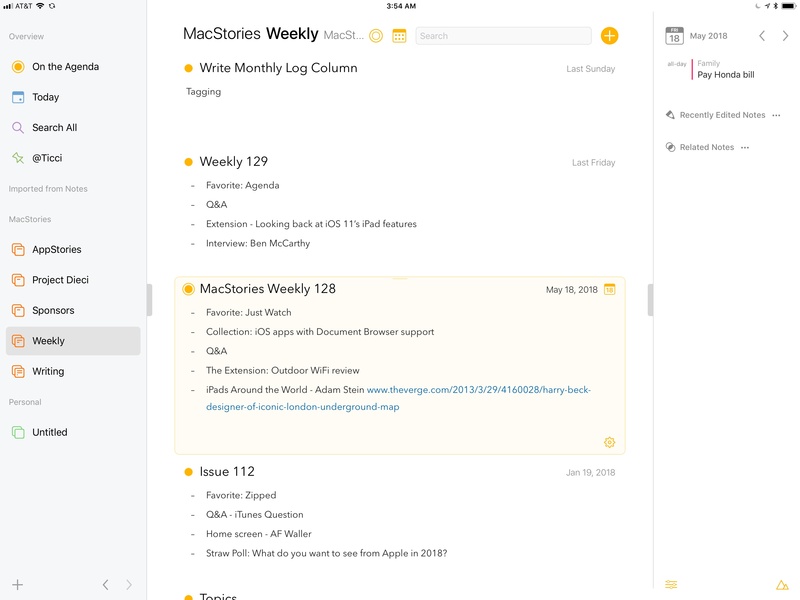 Agenda, which launched on iOS today, is one of the most interesting note-taking apps I’ve used. The app is simultaneously structured around projects, like a task manager, and dates, like a calendar app. Agenda immediately caught my eye with its beautiful design and unique approach to notes when it launched on the Mac in January. At the time, I was intrigued by Agenda, but the lack of an iOS version was a deal-breaker. Notes apps are one of those categories that benefit immensely from being available everywhere. 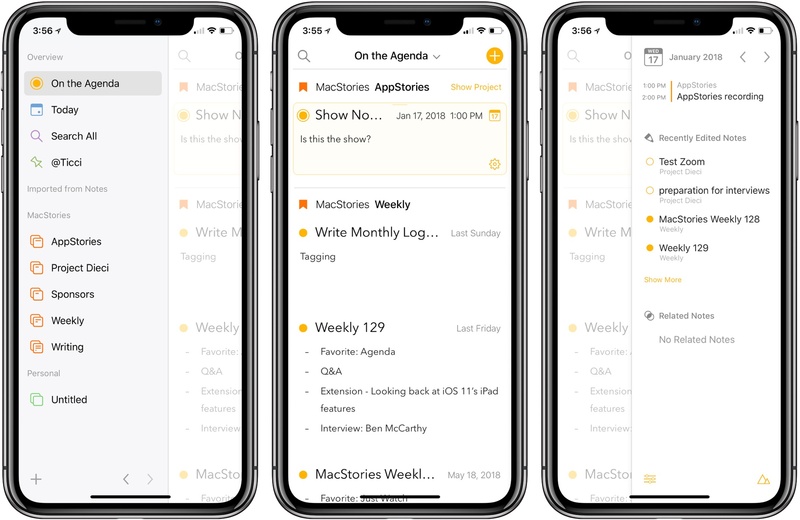 When I tested Agenda in January, I found myself on my iPad wanting to refer notes that were locked inside Agenda on my Mac almost immediately, so I put Agenda away and waited for the promised iOS version. On the iPhone, Agenda uses the same sliding panels where they dominate most of the screen. With today’s release of Agenda for iOS, which syncs between platforms, that’s no longer an issue. The Mac and iOS versions are virtually identical in their designs, interaction models, and feature sets. I won’t repeat the details here. You can learn more about the app’s structure and design from my review of the Mac version. Instead, I want to focus on the ways I’ve begun to integrate Agenda into my work over the past week that I’ve had the beta; with an app as flexible as Agenda, concrete examples of how it can be used are more useful than a list of features. Cardhop from Flexibits got an update to version 1.1 today, and it packs in some pretty great improvements for an incremental update. If you missed it before, Cardhop is the app from the makers of Fantastical that does for contacts what Fantastical did for calendars. 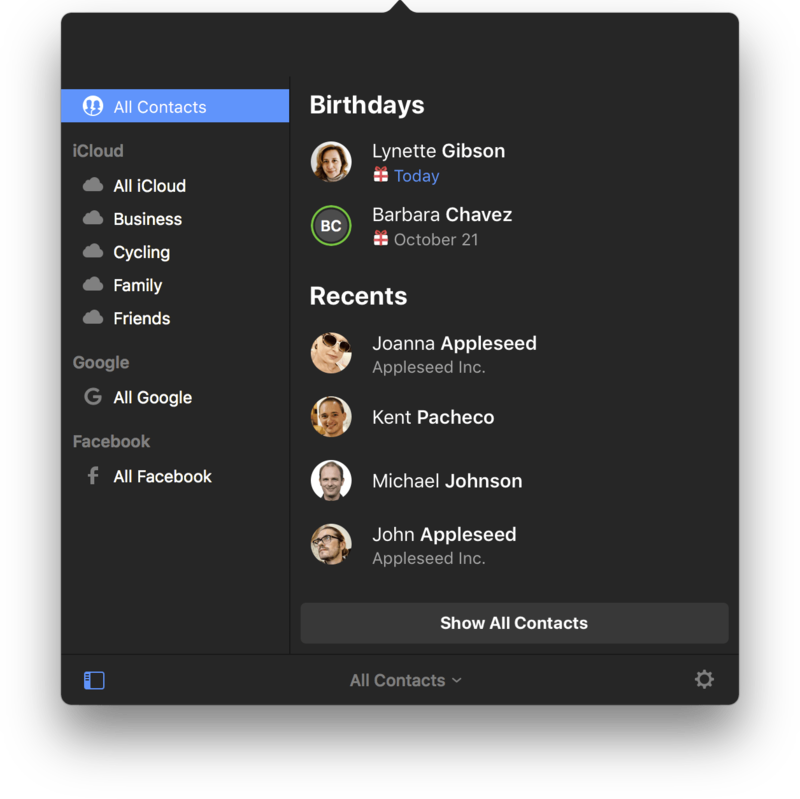 All your contacts are managed from your menu bar, and you're never more than a few keystrokes away from sending an email, making a call, sending a text, or anything else contact-related. Type "email elle" and it will find Elle's card, pick the first email address, and hitting enter will fire up a new email in Mail (or your favorite mail app). Type "call mom home" and handoff a call to Mom's home phone number. It's far more powerful than that, but I'll refer you to John Voorhees' great writeup back in October for the overview. Cardhop 1.1 comes with some fixes and improvements, not least of them being parsing and formatting support for French, German, Italian, Spanish, English, and Japanese. But the two updates that I personally find the most useful are Smart Groups and printing support. Smart Groups are what you probably imagine – a group of contacts based on a set of criterion that automatically updates as contacts change to match (or fail to match) those criteria. It opens up a few interesting organization and productivity schemes, but my first interest is in pseudo-tagging. I can now add @tags in contact's notes field and have them sorted into one or more smart folders, reducing my need for a large number of "actual" contact groups. And if I stop using Cardhop and need to access those groups in another app such as Apple's Contacts, I can always just do a search for the @tag and drag them into a regular group. The printing features are elegant. 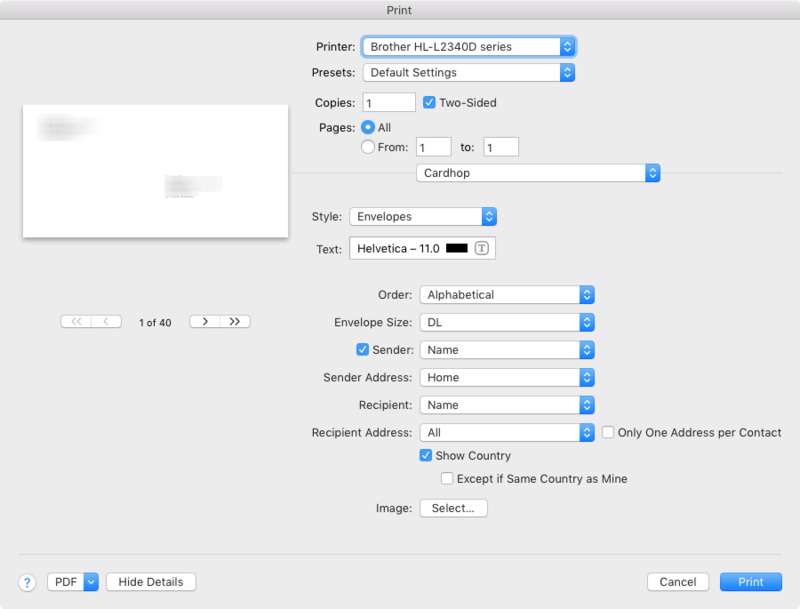 Much like those in Apple Contacts, but with a few extra touches in the print dialog, as well as the convenience of printing right from Cardhop. Being able to pull up a contact or an entire contact group and print envelopes with return addresses, or spit out address labels for the whole bunch with just a few keystrokes is a wonderful convenience. All you have to do is type "print [name]" or "print [group]" (or use a Quick Action). When the print dialog comes up, make sure that you've clicked "Show Details." Other new features include template preferences to control which fields are shown when entering new contacts, an “Add Notes with Timestamp” option to add dated notes to a contact, and typing in the "related contact" field now autosuggests other names from your contacts. I've been loving Cardhop, and I think it's worth anyone's time to grab the free trial and give it a go. Cardhop costs $19.99 US and is available on the App Store and direct from Flexibits. Bear debuted in 2016. That’s given users plenty of time to accumulate large collections of notes, which has made managing them more difficult. With Bear 1.5, Shiny Frog takes note management head-on with an update that significantly improves the way users interact with their note libraries. It's been a busy 2018 so far for Cultured Code, makers of Things for Mac and iOS. 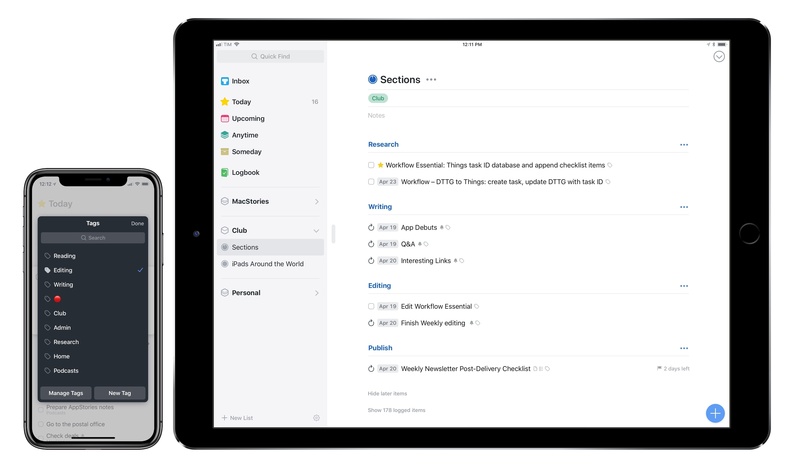 Earlier this year, the company shipped Things 3.4, which, thanks to app integrations and a toolkit for third-party developers, propelled the task manager into the elite of automation-capable apps on iOS. It doesn't happen very often that a task manager becomes so flexible it lets you build your own natural language interpreter; Things 3.4 made it possible without having to be a programmer by trade. Today, Cultured Code is launching Things 3.5, a mid-cycle update that refines several aspects of the app and prepares its foundation for other major upgrades down the road. There isn't a single all-encompassing change in Things 3.5 – nor is this version going to convince users to switch to Things like, say, version 3.4 or 3.0 might have. However, Things 3.5 is a collection of smaller yet welcome improvements that are worth outlining because they all contribute to making Things more powerful, intuitive, and consistent with its macOS counterpart.